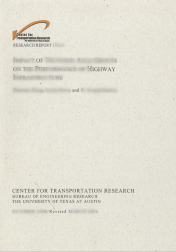 1975 ... by Randy B. Machemehl, Clyde E. Lee, C. Michael Walton · The need for vehicle weight data in planning and designing highway facilities has historically been satisfied by stopping selected vehicles at specially prepared roadside sites and weighing each wheel or each axle of the vehicle on either portable scales or on platform scales. 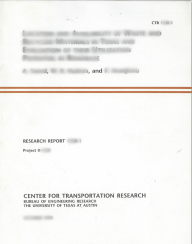 1978 ... Otto Schnitter, W. Ronald Hudson and B. Frank McCullough · The Texas State Department of Highways and Public Transportation (SDHPT) rigid pavement overlay design procedure was developed by evaluating, improving, modifying, and simplifying a recently developed Federal Highway Administration overlay design method. 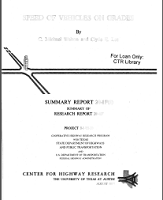 1976 ... B. Frank McCullough and Thomas P. Chesney · This report summarizes the findings of a 16-year study on an experimental CRCP placed on IH 45 in Walker County, Texas. An examination of data provides numerous guidelines for the design requirements and construction specifications of future projects where CRCP will be used. 1973 ... C. Phillip Johnson, Thaksin Thepchatri, and Kenneth M. Will · This research focused on the application of finite element computer programs to complex bridge structures which may be idealized as an assemblage of one and two-dimensional elements. Each two-dimensional element may be either triangular or quadrilateral in shape.